With a new school year comes new books, binders, and notebooks. And with new school supplies, of course, comes the need for a well-fitting backpack. When kids go through the school year with the wrong backpack, they could be at risk of facing injuries such as strains, fractures, or even spinal curvature. To prevent injuries like these from occurring, parents should make sure they know what constitutes a good backpack. A sparkly, cartoon character covered backpack may be your child’s idea of the perfect backpack, but parents should ultimately bring home a backpack that also checks the following boxes. Right size. A backpack that is too big or too small can cause muscle strains or excess shoulder pressure. According to the American Occupational Therapy Association (AOTA), the bottom of the backpack should rest in the curve of a child's lower back. Properly padded. In addition to being appropriately sized, the right backpack should have well-padded shoulder straps. Without padded straps, kids may feel too much pressure on their shoulders and necks. Two straps. Messenger bags or packs with a single strap can cause kids to lean to one side, which can cause pain. Backpacks with two straps are best for a child’s spinal health and comfort, according to the AOTA. Comes with buckles. 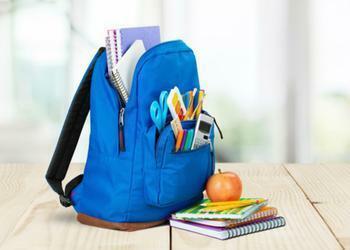 Backpacks with waist belts can help distribute the weight of a full load of books and school supplies evenly, which can help keep back pain at bay. After you’ve found a backpack that fits the bill, it’s important to teach kids how to load the backpack correctly. Keep an eye on the weight of your child’s backpack. If it weighs more than 10% of your child’s body weight, ask if everything being brought home from school is necessary to complete the day’s homework. Finally, parents can teach children to put the heaviest items closest to their backs or to consider carrying a book in front of them if the backpack feels too heavy. Should glasses accompany your child back to school? What can parents do to prepare kids for school?